Target Adds Salty Girl Seafood’s Line of Healthy Seafood Options For Kids — Salty Girl Seafood, Inc.
Better-for-you and ocean-friendly seafood brand, Salty Girl Seafood, announces today the launch of their kid-friendly Salmon Bites line into 250 SuperTarget stores nationwide. 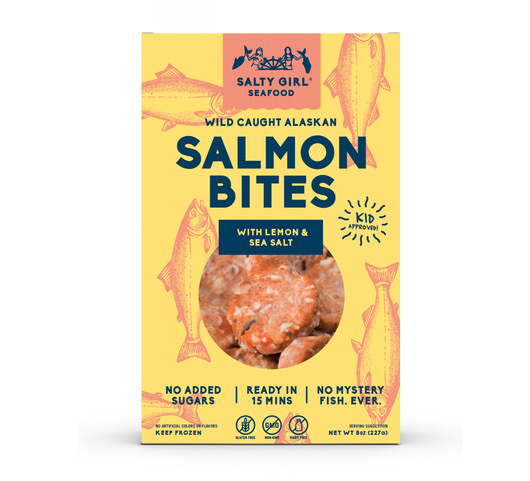 Available at Target in two flavors, Lemon & Sea Salt and Black Beans & Corn, Salty Girl Salmon Bites are full of flavor and made with premium, wild caught Alaskan sockeye salmon. Packed with omega 3s, protein, and hidden veggies - all in one easy bite that the whole family will love! All of the good stuff without the gluten, dairy, or added sugar, this is the perfect go-to for moms in search of healthy, easy to prepare protein for their families. Straight from the freezer and into the oven or skillet, Salty Girl Seafood Salmon Bites are ready in 15 minutes and were developed for kids and parents to enjoy. These Salmon Bites are good for the ocean, too. All Salty Girl products are sustainably sourced, and each package of Salty Girl Seafood shows where your fish came from. Parents can feel confident knowing what their families are eating and encourages a conversation about where food comes from at an early age. Salty Girl Seafood first came to Target’s attention in 2017 when the brand was one of ten brands selected to participate in Tarket Takeoff, a consumer product startup accelerator developed by Target Corporation. “We are grateful for our Target Takeoff experience and are excited to expand our mission and grow our line into stores nationwide,” said Eddy. The Salmon Bites line can be found in the frozen seafood section of all SuperTarget stores nationwide. Salty Girl Seafood, Inc makes delicious and convenient sustainable seafood products for today's health-conscious families. Founded by ocean-loving women and fisheries scientists, we are launching a generation of kids who will not only eat more seafood, but feel empowered to make good decisions about where that seafood comes from. Salty Girl Seafood is sold in stores throughout the United States. For more information on Salty Girl Seafood products, please visit the Salty Girl Seafood website or follow on Facebook and Instagram.